Cafe con leche, por favor! I probably started drinking coffee out of a baby bottle. As a kid, I drank it after meals and mixed it in my milk for breakfast after late nights. When I discovered Starbucks as an adult, I couldn’t understand why I couldn’t get a caffeine fix from it. That’s when someone tipped me off that I’d been drinking the hard stuff, expresso, all my life and Starbucks coffee was way watered down. Though I’ve since given up the need for caffeine, I thought that as part of my husband’s acculturation process I would introduce him to Cafe Bustelo. He was high for days. He, apparently, had never had the hard stuff before. But now, like a good husband, he swears by Dominican coffee. Recently, we’ve taken it up to the next level. 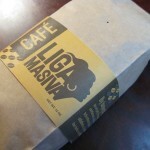 We’re getting our coffee straight from Dominicanos, and organic no less, thanks to Liga Masiva. Our first package just arrived. We ripped open the package and our nostrils were met with the most delicious smelling coffee we had ever sniffed. We’re hooked and I know you want to be. I never even thought of getting Dominican coffee… hmmm…After Pesach. Ah, I started drinking Italian coffee when I studied there. Thick, tiny cups of espresso. You know the latte–in Italian, that just means milk, and if you order one outside of touristy area, the server will just look at you confused before handing you a cup of milk.My favorite thing on earth is making good quality hot chocolate (mine is dark and thick) and cutting it 50/50 with espresso. So good. Sounds great. I wonder if I can get Dominican coffee anywhere in Chicago?